Chronic Leg and Foot Pain? Suffering from painful diabetic neuropathy? Have you spent years with no solutions, no answers - just pain? You don't have to live this way. Our products have a permanent goal: Reduce your pain. At Last - Reduce Painful Diabetic Neuropathy. Without Pills. With Research-Proven Results. Prizm Medical, Inc., is the premier developer and manufacturer of electrotherapy devices and Intelligent Textiles for Medicine. As the developer of the world's first garment electrodes, the company has been in the forefront of research and development addressing painful diabetic neuropathy for over a decade. By increasing microcirculation to treat acute and chronic injuries, our products accelerate the body's own natural healing process while treating and relieving pain. Read more. We can help you with your foot pain or leg pain. Whether its painful diabetic neuropathy, foot arthritis, chronic wounds, peripheral vascular disease, heel pain, an achilles tendon injury, shin splints, plantar fasciitis, or some other leg or foot nerve pain. 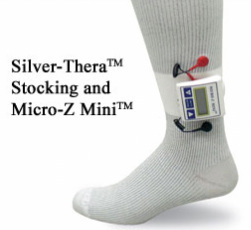 Our products and solutions will help to remedy your foot pain or leg pain. Our innovative products are designed for comfort and are as easy to use as putting on your socks - worn anytime night or day. Read more. 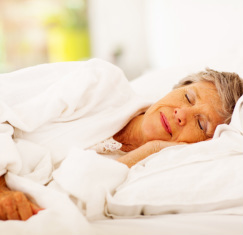 night’s sleep is the most important part of the day, our products are specially designed to be used during the night. Learn more. Copyright 2015, Prizm-Medical, Inc. All Rights Reserved. Site design by Wend Communications.